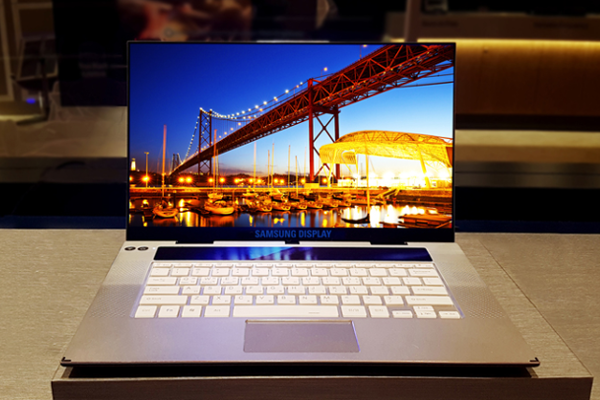 SAMSUNG shows off World's first 15.6-inch 4K OLED display for Laptops/Notebooks. Samsung Display today announced that it has succeeded in developing a 15.6-inch UHD (3840 x 2160 pixels) OLED panel - the world's first UHD display for the notebook/laptop market. The newly released display will provide ultra-high resolution optimized for gaming, graphic design and video streaming. The new display provides a spectrum of 3.4 million colors (double that of similarly sized LCD panels), which allows for truly life-like images, with colors meeting the DCI (Digital Cinema initiative)-P3 standard, the specification best suited for video streaming. The 15.6-inch UHD panel is designed to keep the complete DCI-P3 color gamut fully intact while emitting significantly less blue wavelengths that can potentially be harmful to the eye, making images easier to view even after prolonged use. Notebooks, unlike desktops, are exposed to continuously changing ambient brightness depending on the user's environment at any given moment. Samsung Display's new 15.6-inch OLED panel comes with a 1.7 times higher color volume compared to LCDs of similar size, which improves the clarity of outside viewing while also reducing imagery degradation outdoors. Samsung Display emphasized that its 15.6-inch UHD OLED panel meets the latest DisplayHDR True Black specification released by VESA (Video Electronics Standards Association). With black color that is a hundred times richer than the previous HDR standard, Samsung Display's newest panel brings a very significant enhancement to HDR, in depicting high-contrast almost as well as the human eye, making black imagery blacker and white images whiter. The display technology giant said it will begin mass producing the 15.6-inch UHD OLED panel in mid-February, initially for use in premium notebooks produced by leading manufacturers.